Favorite Line: Thus began the plan for my half-century Birthday Garden: Higgledy-piggledy, florescent and spontaneous, like friendship itself. 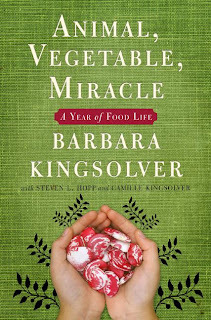 This book chronicles the year that Barbara Kingsolver, along with her husband and two daughters, made a commitment to become locavores–those who eat only locally grown foods. This first entailed a move away from their home in non-food-producing Tuscon to a family farm in Virginia, where they got right down to the business of growing and raising their own food and supporting local farmers. For teens who grew up on supermarket offerings, the notion not only of growing one's own produce but also of harvesting one's own poultry was as foreign as the concept that different foods relate to different seasons. While the volume begins as an environmental treatise–the oil consumption related to transporting foodstuffs around the world is enormous–it ends, as the year ends, in a celebration of the food that physically nourishes even as the recipes and the memories of cooks and gardeners past nourish our hearts and souls. Although the book maintains that eating well is not a class issue, discussions of heirloom breeds and making cheese at home may strike some as high-flown; however, those looking for healthful alternatives to processed foods will find inspiration to seek out farmers' markets and to learn to cook and enjoy seasonal foods. Well, good thing I have a trip to India planned this summer. The bananas there are both local and delicious. That's the point of this book. How often do people today stop to think about the food they are eating? How many people even know when a particular type of food is in season? I certainly don't, for the most part. I bought chives at the farmers' market the other day and probably caused the farmer some heartache when I remarked that I didn't know chives had flowers. They do. Did you know that? Kingsolver, her husband and her daughter wrote the book and it is chockful of disturbing facts about how much fuel it takes to bring a banana to Chicago, and how many pesticides are in our grain, and how almost all the diverse and fabulous native plant varieties of the United States are slowly going extinct (that's right- extinct) because large farming corporations control our seed supplies. Kingsolver is pretty left-wing and she clearly has serious issues with the World Bank and other organizations, but her points are valid. It is more than a little frightening to be bludgeoned over the head with the statistic that most food in the United States travels about 1,500 miles to get to your plate. That means fruit in this country has more passport stamps than I ever will. The book's writing is very dense- in general, I feel that memoirs are fast reads, but this is almost more a treatise and a plea than a memoir. It is jammed with recipes and short essays and lots of information on the mating rituals of turkeys. In my opinion, all three authors can be a bit sanctimonious and overzealous in their writing. Barbara Kingsolver spends about ten pages ogling over asparagus. Her husband seems to have visited every possible organic food website on the Internet and urges us to do so as well. And Camille... well, her parts of the story just seemed a bit stiff and forced to me. But really, the family clearly has a passion for what they do. I do not own an Appalachian farm where I make my own cheese, can my tomatoes or try to induce turkeys to mate, but after reading this book, I have visions of myself with a victory garden-esque vegetable patch growing in my parents' backyard. There are decisions we make in life, and the passive ones are often just as important and impactful as the active ones. I have recently made a very active and terrifying decision about my future career path. That will undoubtedly change the course of my life going forward. But decisions purchasing food, cooking it and eating it- those are generally decisions people make without much thought, and that behavior has gotten us into a ridiculous situation. Just because you don't think much about what you're doing doesn't mean it's not making an impact in a profound way. This is one of those books that makes you consider those decisions. It might not change your life, but I guarantee that it will make you pause, and to really think, next time you're in the grocery store. And considering how huge the local food scene has gotten recently... it's possible that Kingsolver has helped kickstart a very important movement. Interesting, still not for me. I to tend to stick with fiction. I have had this book for a while and still haven't read it! I must remedy that! Good luck with the scary career decision! Living in CA, I was a little gobsmacked to discover how much of our produce comes from Chile. We grow more than half the veggies in this state. It is good to eat localy and in season, but OTOH, the big farms are one of the reasons why while there's hunger in the world, there's a lot less than there used to be. I am really glad you reviewed this one. I had been curious as to the style and content of the book, and had been wondering if it would be an interesting read. Based on your review, I think I will be picking this one up. Although I also don't think that this book will change my life, but I am certain that it will be revealing and eye-opening in a positive way. Great review! Btw, I just saw your ,Heroines Who Don't Annoy Me sidebar - that's hysterical! !